The new Council said it would commit to transparent processes – what does that mean? What about open budgeting? Ottawa’s example is worth considering. The Coalition of Kingston Communities is pleased to report that the all-candidates meetings held throughout the city were a tremendous success, thanks to the candidates who participated and addressed a range of important issues, the moderators who did an excellent job running the meetings to ensure they were fair, and of course, the public, who came out, listened, and asked excellent questions. Many thanks, too, to those who generously donated to help defray the costs of the meetings. In total, there were 13 meetings throughout Kingston, some organized by local community groups, most organized by the Coalition and its intrepid team of volunteers, in keeping with our mission of improving the accountability of City Hall. 33 candidates participated, and close to 1,000 people attended. It was the first time that meetings were held in all contested races in the city. The mayoral meeting was standing room only in Memorial Hall, with over 300 people in attendance, a long queue of questioners, and a lively discussion about the issues facing Kingston. The series closed with the Sydenham all-candidates meeting on Sunday at KCVI, organized by the Sydenham District Association, drawing over 100 people. Many thanks again, and remember to vote on October 22nd! ALL CANDIDATES MEETINGS A GREAT SUCCESS! The all-candidates meetings organized by the Coalition of Kingston Communities have been a tremendous success, with over 200 people attending the meeting for Lakeside District. Six candidates were originally running in Lakeside, but Ed Smith announced his withdrawal from the race in his opening statement at the meeting. There was a long line of questioners in the packed room who raised a range of issues, and former MP Ted Hsu moderated the discussion with the 5 remaining candidates. The Coalition is the first group to have taken on the task of ensuring there are all-candidates meetings in every district in the city as well as for the mayoral race (see attached roster). Some districts have never had such a meeting (Loyalist-Cataraqui) and others have not had one for a very long time (Lisa Osanic remarked after her meeting that she had not seen one in all her 12 years in office). Especially remarkable is that this is being done by a committed band of volunteers, with no budget, digging into their own pockets for the costs of the sound equipment, room rentals, etc., just ‘passing the hat’ at the meetings in the hopes of recovering their costs. The Coalition has been asking Kingstonians to spread the word. The meetings, which have been publicized throughout social media, have all had distinguished moderators and a professional sound system. The Coalition’s first all-candidates meeting was held September 24 at Central School to a crowd of 40 people in King’s Town District. Pictured is incumbent Councillor Rob Hutchison, who addressed questions from district residents. Byron Emmons, who is the other candidate seeking the seat, declined to attend. Thanks, everyone, for coming out! Please keep an eye on the schedule below and come out to future meetings! 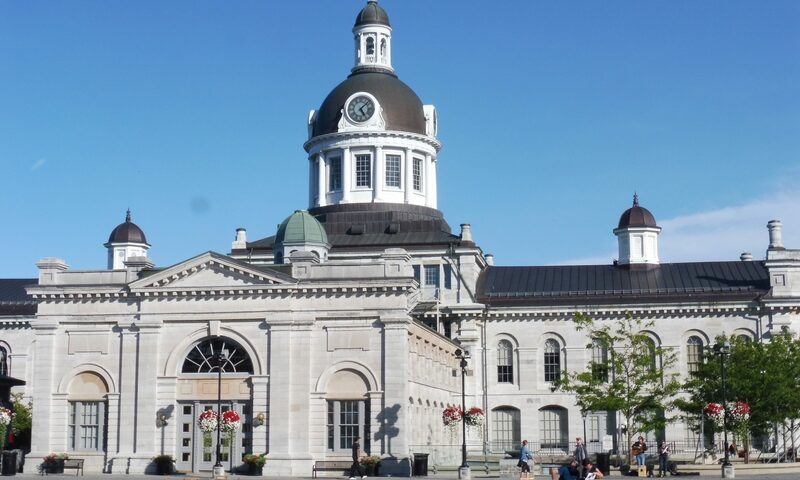 The Coalition of Kingston Communities (CKC) is dedicated to improving the processes of civic engagement and accountability of City Council and City Staff, in order to further the wellbeing of Kingston. The CKC is made up of community associations and community groups that support the Coalition’s mission. All residents of Kingston are welcome to participate in Coalition meetings. Since November 2015, the Coalition has been a ‘clearing house’ of concerns on process issues, enabling community groups to exchange information and keep each other informed. We have produced a Planning Brief and commented on the City’s progress on process issues, made several delegations to Council and the Planning Committee on matters of process, have met with the Mayor, and appeared in the media. The CKC is an umbrella organisation of community groups, although individuals are very welcome to participate. A community group is defined as having at least 6 Kingston residents who participate in its activities and a mission statement (this can be very simple, like representing the residents of a neighbourhood, or fighting for/against x policy). Community groups on the Coalition’s mailing list will be contacted annually to confirm they wish to remain members of the Coalition. The CKC will communicate with member groups and individuals by email sent to the contact address provided by the group or individual. At the CKC annual public meeting to be held in the autumn each year, the Chair will open the floor for nominations/volunteers for the Coalition Board. Each nomination must have three people endorsing the candidate. There are a maximum of 9 positions on the Board. 6 must be filled by members representing community groups. The slate of nominated candidates will be voted on by all individuals present at the meeting. The elected Board will subsequently meet to vote among themselves on who should fill the following positions: Chair, Vice-Chair(s), and Secretary. If there is an insufficient number of Board members, the Board will have the authority and responsibility to fill the vacant positions. The CKC Board will send out emails to keep members informed of Coalition concerns and about local issues of mutual interest. The Board will invite community groups and individuals to join a committee working on a response to a specific concern or issue. The committee reports to the Board. The CKC membership will be contacted by email and asked for input on a policy position before the Board makes its decision. Policy positions will be determined by the Coalition Board by majority vote. It will be understood that although community groups from across the City share the Coalition’s mission, not all community groups will be concerned about, or agree with, all positions taken by the Board.